I’m not the best of thematic collectors, I appreciate that, and I have very much a love/hate relationship with it. I find that it is sometimes incredibly difficult to match philatelic items with what I have in my mind, with how I want my story to develop. 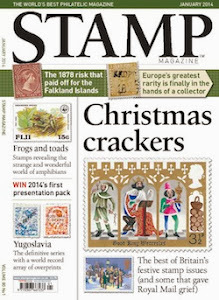 Do others tweak the story to match their philatelic items? That would be much easier, I suppose, but there’s no way I can do that with my Peacemaking collection. For those of you who haven't heard me go on about that; I'm working on this collection on the aftermath of World War One, and am doing so based on a book by Margaret MacMillan called Peacemakers. Basically what I'm doing is trying to illustrate her story with philatelic material, and I take her index as my guidance. Still working through the letter A, you can see the results for entries such as the Aland Islands or Abdullah, Ruler of Jordan if you click on the Peacemaking label at the end of this blog or on the panel on the right. And so you may find me struggling big time whilst trying to get together a worthwhile entry on General Edmund Allenby. As far as I could find out there were no stamps depicting him. Never a good start. It’s not that Allenby plays such a vital role in my story. He flits in and out a bit, to be honest. He is mainly part of the power struggle between the British and the French in the Middle East, during the latter part of the 1910s. 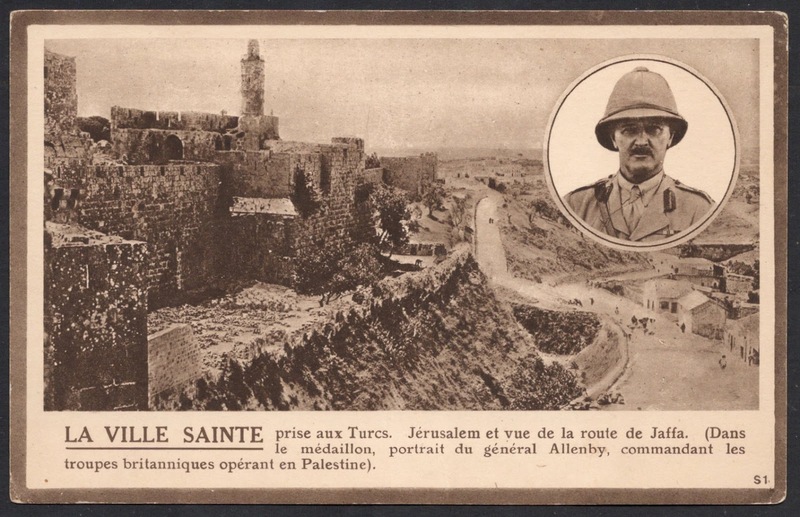 Luckily for me, I have long ago decided that, for this collection at least, postcards are philatelic items too, and so I was rather happy to find this postcard dealing with Allenby sweeping the Turks out of Jerusalem at the end of 1917. The French weren’t too happy with that and feared that the ‘Protestant Peril’ would be taking over the Holy Land. Allenby on the other hand warned the Peacemakers in 1919 that a French occupation would enrage the Arabs. He said so after having been summoned to Paris from Damascus. 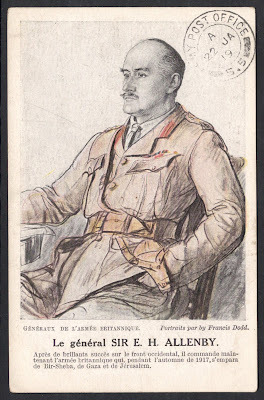 While there, postcards were made of a number of prominent military leaders, with Allenby being one of them. I know, yet another postcard, but at least this one has a proper Army Post Office postmark, which is not part of the original design or card. 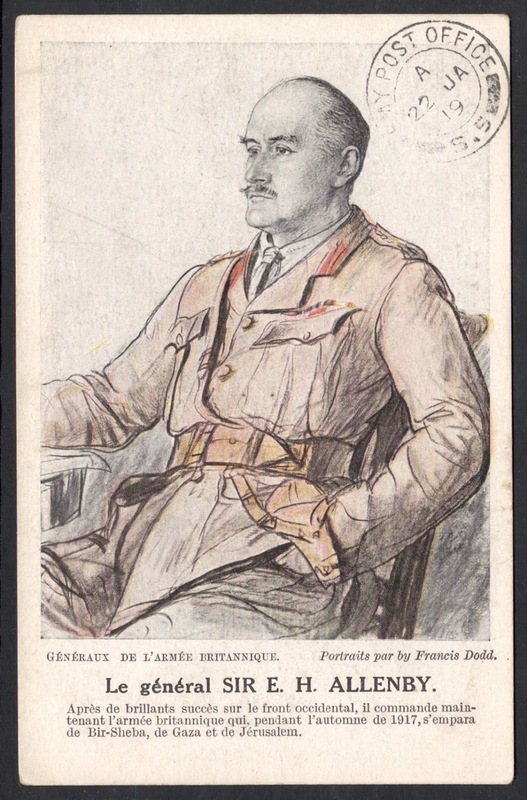 The British were very much taken with Allenby’s military victories and his stance against the French. So much so that he was included in the ‘Lord Roberts Memorial Book’ of cinderellas. They were, however, less taken with his stance against British policies in Egypt. In 1919, the British had clamped down hard on the Egyptian independence leader Zaghlul which had led to serious riots and violence. Allenby was despatched to prevent the British from losing Egypt altogether, but much to the surprise of the occupying authorities, Allenby stated that the only way to even begin to restore order was to free the nationalist leaders! Allenby had shown similar intelligence in Palestine, where he had set up a military administration in 1917. 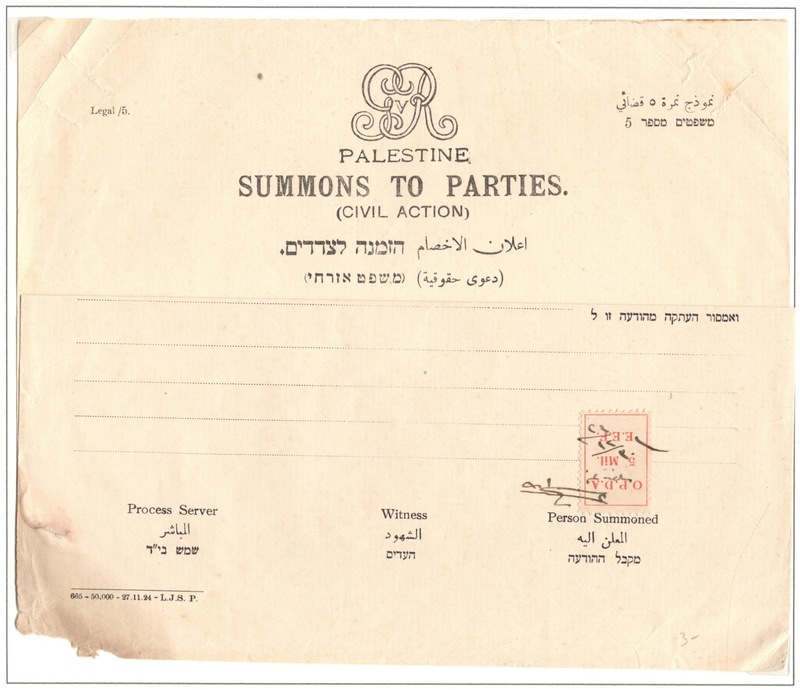 To appease all parties, he had ordered that all official documents should be translated into both Hebrew and Arabic. This (folded) court summons of the mid-1920s shows that this practice endured. 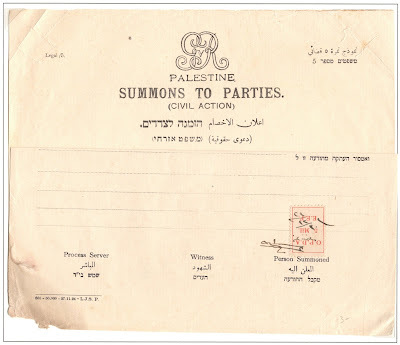 And it’s got a nice Palestinian revenue stamp on as well, if you like that sort of thing. So in the end I was actually rather pleased with what I had been able to find and moved on to the next subject with a little less trepidation! 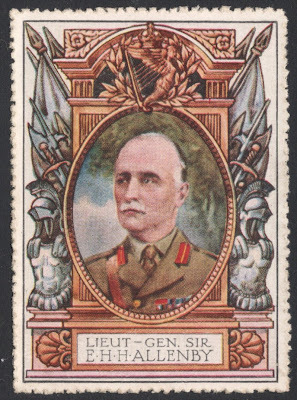 Allenby was one of the few senior officers who gave Lawrence of Arabia his freedom to do much to unite the Arabs in the defeat of the Turks. Greatly overlooked by historians.